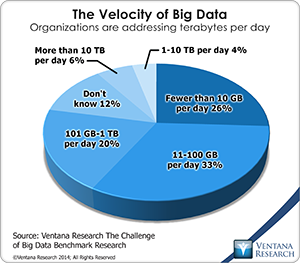 Information technology enables a data-driven management style that was not feasible until powerful, affordable computers became generally available. There’s no bright line marking when this became possible; the process is ongoing. People were using financial analytics long before ENIAC, the first general-purpose computer, appeared, but the metrics available were not especially timely, broadly applicable to day-to-day situations or comprehensive enough to inform most management decision-making. Even today, there are many areas of business management where companies continue to operate much as they have in the past. One of those is pricing. There were two noteworthy themes in SAP CEO Bill McDermott’s keynote at this year’s Sapphire conference. One was customer assurance; that is, placing greater emphasis on making the implementation of even complex business software more predictable and less of an effort. This theme reflects the maturing of the enterprise applications business as it transitions from producing highly customized software to providing configurable, off-the-rack purchases. Implementing ERP will never be simple, as I have noted, but as companies increasingly adopt multitenant software as a service (SaaS), vendors will need to make their implementations as repeatable as possible and enable flexible configuration of parameters and processes that substantially reduce the billable hours required to complete a deployment. “Customer assurance” is an important stake in the ground, but it will be an empty concept unless there is complete overhaul of the entire value chain to take it beyond good intentions. Otherwise, customer assurance will be an ongoing rearguard action to overcome technology-driven challenges and disincentives for improvement. Business applications must be re-engineered to facilitate implementation, substantially reduce the likelihood of implementation errors and facilitate subsequent changes to adapt to changing business conditions. Moreover, software vendors’ partners will need to demonstrate that they can reliably cut a substantial number of billable hours per implementation engagement. This will require partners to restructure their business models. Neither of these changes will be easy to accomplish. To its credit SAP has set a course for increasing the simplicity of using its core ERP and financial management software. Getting there soon would greatly enhance its ability to retain if not gain customers in these mature markets. 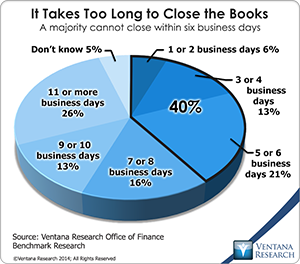 In our Office of Finance benchmark research 60 percent of participants said it takes their companies six or more business days to complete their quarterly close; that exceeds the best practice benchmark of five days. Consultants, academics and vendors have stressed the importance of shortening the close for almost a quarter of a century. The main reason for doing so is to provide executives and managers with timely information about the company’s performance. 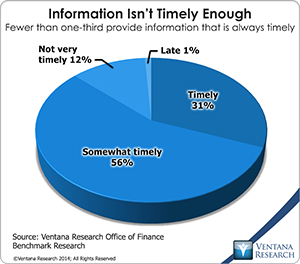 Yet our research shows that it’s taking longer for companies to complete their close than it did a decade ago: On average they now finish the monthly process in 6.8 days, compared to 6.5 days, and complete the quarterly close in 8.0 days vs. 7.5 days. The research suggests that the main reason for this increase is that companies use outdated manual close processes, which often are poorly executed and rely heavily on spreadsheets.